The requirement for the New UYC Clubhouse has arisen because of the flood damage to the existing building. As a result of this, and in order to reduce the future risk of any flood damage, we propose to lift the whole building on top of a platform. The platform will also serve as sun terrace and balcony area overlooking the lake; a terrace will be provided towards the South to benefit from direct sun light during clear weather, and a long balcony will cantilever out towards the lake to provide a long outdoor viewing area for the races. Riaing the building will make it appear as though it is floating in mid-air. 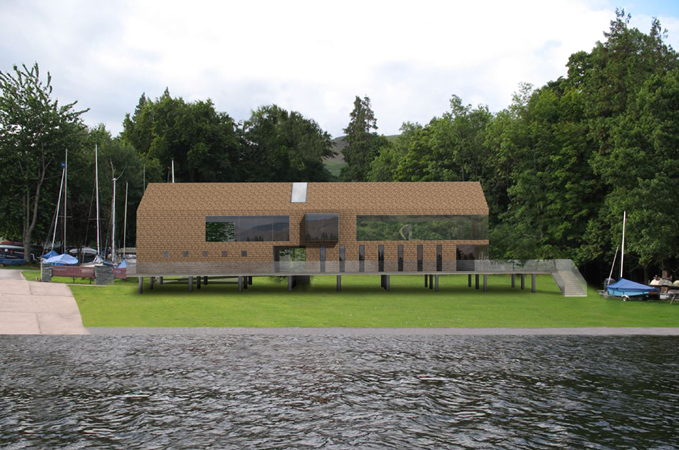 The form of the building is derived from associations of timeless barns and boat houses that form an important part of the building heritage of the Lake District. This building form will be familiar to both local residents and visitors from other regions. 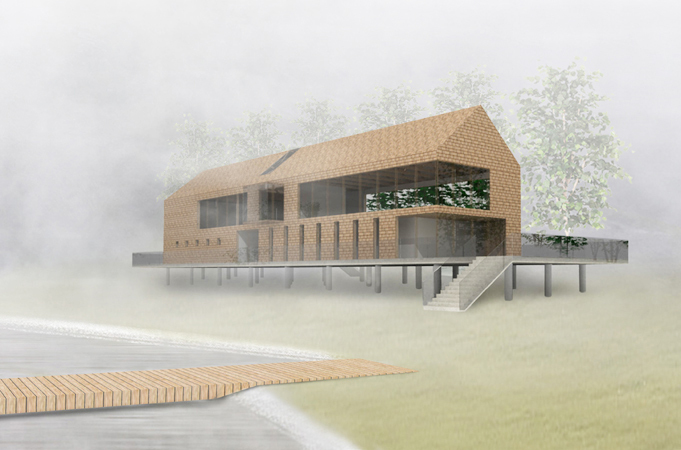 The wood shingle cladding on both the roof and external walls will help to blend the building in its National Park setting, recalling the trees and providing a pleasant natural scent to the outdoor terrace and balconies. The building is conceived in two parts, an enclosed lower level containing the changing rooms, offices and wet bar, and a more glazed higher level housing the main bar and clubhouse. 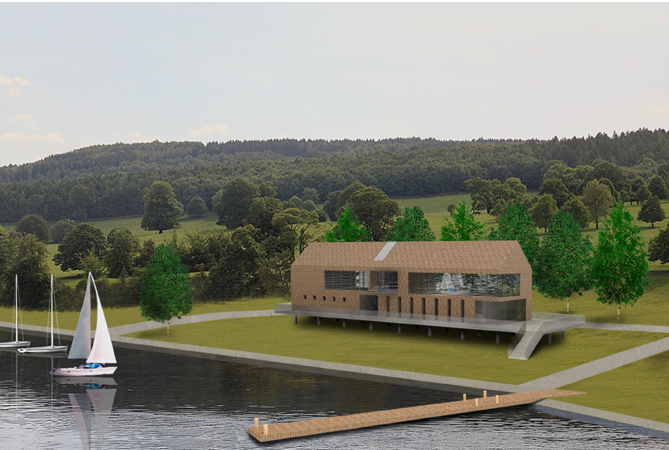 The higher level will benefit from wide views of the lake and landscape, and will benefit from the extra height below an exposed wooden truss supporting the pitched roof. The internal truss will communicate a sense of being inside a large barn. In order to reduce to a minimum the use of concrete for the platform and foundations, we propose a lightweight building structure clad in lightweight wood shingles. As a sustainable roofing material, the timber shingle can only be matched in its low environmental impact by thatch. If sourced in the UK it has the lowest embodied energy of all roof coverings. Care should also be taken in specifying FSC sources. Shingles have relatively smooth faces and backs, while shakes have a highly textured, natural grain face and either a sawn or split back. Cedar shingles used in the UK are usually treated with preservative to meet with the higher risk of decay in this country. A small number of projects have been completed using larch and oak, but feedback is as yet inconclusive. Timber construction is lightweight yet heavy enough to resist uplift. Across its product lifecycle timber has the lowest energy consumption of any building material. Timber structures are carbon negative. Timber acts as a carbon sink. Recycling timber products into energy releases more stored energy than was used in the products production. The site for the New UYC Clubhouse will be in proximity of the existing building, yet about 20 metres distant from it, which will allow the existing Clubhouse to be operational until the new building is complete and ready to be occupied. Some grass bank area will be taken up by the construction work, but it is envisaged that there will be minimal disruption to the club operation and activities. The proposal is to first construct the concrete platform which will be built in a very short period of time in conjunction with the foundations. Following the platform, the next stage would be to erect the wooden structure of the barn on top of the platform, and connect it with the floor joists and roof trusses. Wool itself absorbs carbon dioxide from the atmosphere as it grows. During its lifetime, the average sheep absorbs more than 30kg of CO2 in its wool. In the UK, about 70m kg of CO2 is absorbed in the wool of the country’s sheep flock every year. The enclosed roof and walls of the building are clad in wood shingle, whereas the openings are finished in clear double glazing.